Make a statement to current and prospective clients by presenting accounting and tax service information in a custom designed Franklin Mills portfolios & kit. Accounting records are easily outlined and professionally presented in one convenient file. 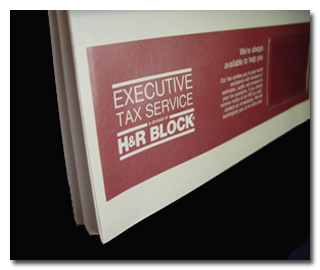 Our portfolios can include custom divider inserts. 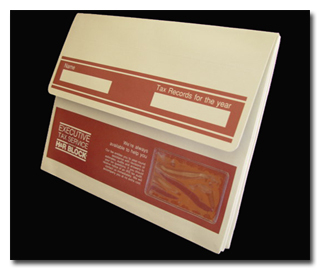 Accounting portfolios can be designed to hold tax forms, returns, documents, brochures and business cards (vinyl ID pocket). Use printed tab dividers to organize sections of the portfolio. Contact the experts at Franklin Mills for assistance in the designing your investment portfolio at 1-888-678-4585.